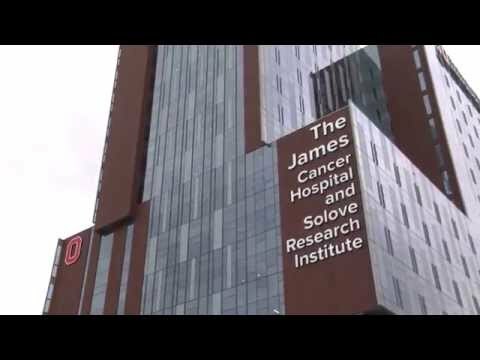 As the country’s third-largest cancer hospital, Ohio State’s James Cancer Hospital and Solove Research Institute (OSUCCC — James) serves as an innovative model for 21st-century hospitals devoted to cancer care. The 21-level, 306-bed freestanding cancer hospital brings together clinical care, research and education in a highly subspecialized care model called precision cancer medicine. Each inpatient unit has its own cancer focus, such as gastrointestinal, head and neck, breast, genitourinary or hematologic malignancies. The oncologists, nurses, pharmacists and genomic experts on each unit treat only that type of cancer. Medical staff collaborate with researchers to examine every patient’s genes and tumor DNA to determine the best treatment and accelerate research discoveries. Translational research labs on each inpatient floor bring physicians and researchers together to develop and deliver targeted treatments. A cancer emergency department—one of only a few in the US—is integrated with The Ohio State University Wexner Medical Center’s main emergency department and includes 15 cancer treatment stations staffed by doctors and nurses specially trained in oncology and emergency medicine. The center’s extensive cancer surgical facilities house 14 operating rooms, including six interventional operating suites and two suites connected to a 3-Tesla MRI, allowing patients to be imaged during surgery. Intraoperative radiation therapy and MRI technologies offer surgeons more precise diagnostics and treatment options. Natural light is a key design feature throughout the hospital. An above-ground radiation oncology center with seven treatment vaults is located on the hospital’s second floor, providing access to natural light and views overlooking a park. Patients, visitors and staff can enjoy outdoor cafés and terrace gardens on the 14th floor, where plantings include vegetables with cancer-preventive properties. To enhance safety, all private inpatient rooms feature identical layouts. Sophisticated technology supports patient care and entertainment, while large windows offer expansive views. Hotel-like amenities accommodate families and visitors. Each floor also integrates visitor lounges, consultation rooms, Wi-Fi capabilities and respite areas. Reinforcing The Ohio State University’s commitment to sustainability, the project earned LEED Gold certification. The HOK-designed James Cancer Hospital and Solove Research Institute at Ohio State University is one of the country’s largest, most innovative cancer hospitals. Check out OSU’s official website for the Wexner Medical Center Expansion. Read the OSU Wexner Medical Center Expansion blog. Watch highlights of the OSU Wexner Medical Center’s topping out ceremony on YouTube.